You can buy the book here: Amazon, Barnes and Noble, or on IndieBound. Congratulations to our giveaway winner, Erin who won the KitchenAid Crystal Blue Diamond Blender. The dishes that define her as a cook are dirt bars and macaroni and cheese! 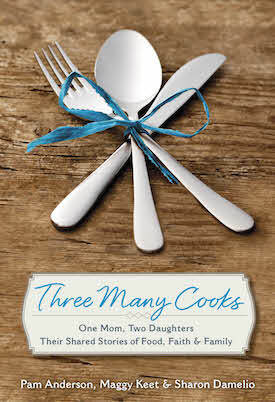 As we crossed into 2015, we knew three things were sure to happen—Maggy’s baby would be born, our mother/grandmother would die, and our book—Three Many Cooks: One Mom, Two Daughters, Their Shared Story of Food, Faith, and Family—would be published. Dashiell Collins Keet was born on January 16th, Della Ruth Skipper died on March 18th, and our book will hit the shelves next week on April 14th. This book is really the story of who we are, the food and the people we love, and what cooking has come to mean for us and our communities. We have a lot to say about our book, but on this day, we’ll let the video trailer speak for itself. A big, heartfelt thank you to our friends Deb and Rod Smith of SmithBites for so beautifully filming and producing it. To celebrate the launch of our book, KitchenAid is giving away a Crystal Blue Diamond Blender which is my favorite, most used KitchenAid appliance (Sharon’s is the Pro Line Stand Mixer and Mom’s is the Pro Line Tea Kettle.) We love the Crystal Blue color, particularly because it matches our book jacket! To enter, just tell us: What’s the dish that defines you as a cook? What are you best known for? Giveaway ends Tuesday, April 14 at 12:00 PM EST! Soup is my superpower! I can turn just about anything into a delicious pot of soup, most of which goes into the freezer for easy winter meals. Even though my repertoire has expanded tremendously after meeting Pam and Maggy, I think it’s still my simple risotto that friends ask for most. I’m best known for my mandel bread and chess squares which are not made with a yellow cake mix. It’s from scratch. I think I would be best known for my sweet tea. I used to have a friend who lived across the street from me and should would come over my house every afternoon after work while I made fresh tea. We shared our loves, our frustrations, our faith and gave each acceptance and love while we shared a glass a fresh tea. She would leave to start dinner and I would do the same. I miss her as she moved away after two years (her husband was military), but we still stay in touch and reminisce about our love of sweet tea! i make gorgeous cheesecakes for most special occasions. One of the things that I’m known for and my family loves for me to cook is Shrimp and Okra Gumbo. It’s something I had to learn very early on in my marriage as it was my husband’s family favorite-signature dish. My husband now loves my version and thinks it is the best. We mark 40 years of marriage this June. Yikes, that’s a whole lot of gumbo! My soups! Chicken, mushroom barley, lentil, moroccan split pea, etc…. While I make many “requested” items my scratch bbq sauce and spaghetti sauce are most requested, I guess that is what best defines me at this moment. I am blessed to make bread from scratch – freshly milled spelt – and smell the goodness all over my home! I am known for my baking and my most requested baking item is my strawberry lemonade cake, everyone who has had it adores it. I am best known for my ability to walk into a kitchen and make a wonderful meal when everyone else thinks there is nothing to cook. Those meals define me as a cook! CRUSTLESS Crab Quiche is the dish people ask for. It’s simple, versatile, good hot, room temp or cold, for breakfast, lunch or dinner. We use our harvested crab when we have some. But mostly I can make it in my sleep, giving me time to spend with friends and family. I guess I’m known for my baking ie breads, pies, cookies. The bread I’m most noted for is a multi seeded sourdough bread. I make a lg loaf once a week. The nice thing about sourdoughs is that it stays fresh longer than most breads. The family loves my Italian chicken sandwiches, BBQ pork sandwiches, and brownies. And everyone knows to expect dozens and dozens of cookies at Christmas! I don’t think that I have been cooking/baking long enough to have to defining dish. What my wife says is that she does sweets and that daddy does sweets/dessert. I make a mean chocolate chip cookie and lemon cupcake. The dish I love to make for our family (never any leftovers) and give to new moms is Le Leche League’s Hamburger Soup. Delicious, organic ingredients that make taste buds hum and bodies feel great. The dish that defines me as a cook is my Lasagna for sure, I am know to make a really good Lasagna. It is a family favorite. I am known for my many different Crock Pot dinners, and one of our favorites is my Sweet Barbecue Pulled Pork sandwiches that I make in the Crock Pot! It is so delicious. Also I make the best Coleslaw! Eggplant and chicken parmigiana. Two very old world family cookie recipes and all tarts! The book looks great! I’m probably best known for baking. I’d say various cookies and challah are defining dishes for me. I’m best known for my baking. Cakes and cookies are what I’m asked to make the most. I make a chicken/tomato/green pepper bake to top on rice. I am known for my Sunday dinners but my niece and nephews always request my mac and cheese. My Grandkids call them “Papaw Waffles” made in an antique cast iron waffle iron. Salads, mostly the homemade dressing. My mom makes the best salad dressing and me and my sisters helped early on. I remember being sent to the garden to pick a variety of herbs, sometimes not sure what I was supposed to pick. Now, I grow some of my own herbs and the lettuce comes from wonderful local vendors at the farmer’s market. I love to cook southern comfort meals on special days!My friends and family love it when I make my special meatloaf. (And zangy meatloaf sauce! )I’m the mother of four (plus a myriad of nephews and nieces, sisters and friends) so meals are often a big event in our house! My 3 year old daughter Ella is autistic and mostly nonverbal- yet even Ella makes it known that my meatloaf is a hit! So sweet! I’m also have a big following for my Enchilada Casserole and Quiche! 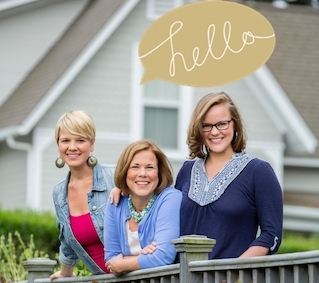 Most of all, I love the way crafting a meal brings my sisters, family and I together. I’m so grateful I stumbled past your blog!! My carrot cake. It was one of the first things I started making regularly when I began cooking and my now grown children still ask for it as their birthday cake. White Chicken Chili on New Years Eve. Comfort foods, meatballs, baked mac and cheese, mexican lasagna……. My dish would have to be my mom’s polish sausage and vegetable soup! My breakfast cakes! I have a handful that I rotate and adapt, but I’m always expected to bring them everywhere I go! Pasta primavera and zucchini lasagna.